I am often asked if I ever get tired of touring Rome. In a city that has been referred to as an eternal city since the time of Augustus, the answer is no. When Augustus was elected the first emperor 2000 years ago he referred to Rome as an eternal city to usher in a period of confidence after a tumultuous end to the Republic. He wanted to draw on ideas of birth and rebirth, recalling even at that time Rome's great past and its future potential. His great Ara Pacis monument near the Spanish Steps and Piazza del Popolo testifies to this. The idea of Rome as an eternal city still rings true. I never grow tired of the constant re-use of space and the city's eternal urbanity. Please check out the several blogs I researched for Hosted Villas published in A Luxury Travel Blog about some of my favorite places that bear witness to the city's eternal life. From family restaurants drawing on centuries old farming traditions to cafes converted from neoclassical artist workshops and medieval monasteries. Last spring I had the great fortune of being a guest at the luxurious Il San Pietro di Positano Hotel on the Amalfi Coast. 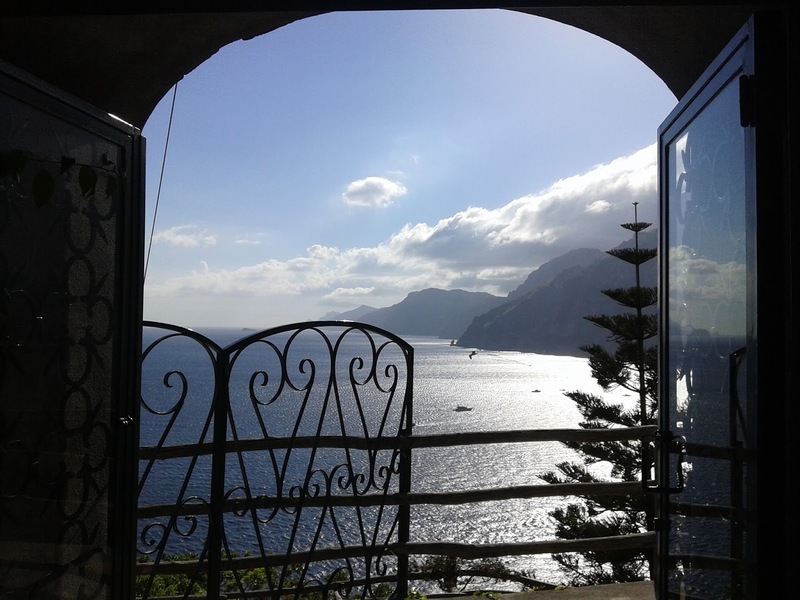 Each town along the coast attracts a diverse melange of visitors, from Julia Roberts and Robert Di Niro who were former guests at Il San Pietro, to locals from the port cities of Naples and Salerno who buzz around on cliff's edge on Vespas rushing to relax in Ravello or Sorrento. My luxurious stay on the Amalfi Coast was a far cry from my ancestry I was digging for in the region. My grandfather, who immigrated to New York from the region roughly a hundred years ago, was from a small town between 2 of southern Italy's most beautiful places, Positano and Matera. At the time of his embarkation life was destitute and millions of residents had no choice but to abandon their beautiful land. Now the area is one of most popular tourist destinations in the world. Traveling south to discover my roots I visited Matera, the former capital of the Basilicata region in southern Italy. The region's current capital is the city of Potenza, but unless that is your last name and you are motivated by personal curiosity, Matera is far more worth your time. It may no longer be Basilicata's capital but it just received the award for European Capital of Culture. It is the oldest continually inhabited city in Italy and a land of crossroads. The deep history and diversity of its people is reflected in its mysterious caves. As much as I've been dedicating my energies to promoting Etruscan tourism around Rome (and an exciting 6th Century B.C. vase on display in Cerveteri, repratriated from The Met in New York), food tourism seems to be a lot more relevant lately. This year's theme of the World's Fair being held in Milan is "Feeding the Planet" designed to raise awareness about the effects of industrial farming on the environment. The fair itself left a lot to be desired, comprised of elaborate pavilions for each country with very little information. The best pavilions in my opinion were from Brazil, a pavilion that involved hiking a tarp to get inside, and the Israel pavilion dedicated to their invention of the drip irrigation system. There was an entire section of the World's Fair dedicated to the movement of Slow Food, best summarized as the opposite of fast food. The movement began in Italy in the 1980's as an attempt to get the rest of the world to cook and eat like the Italians, with fresh and local ingredients. Despite the Italian reputation as such, the historic center of Rome is suffering as it concerns the production and service of quality and healthy food. Only two restaurants inside the city walls have been given the "snail of approval" from the Slow Food association in recognition of following the slow food philosophy of freshly made, locally grown, affordable food. The owners not only have the "snail of approval" but are involved in leading food tours in the neighborhood teaching about local dining and food shopping customs. 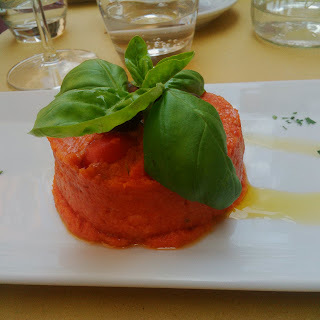 My favorite appetizer at Grappolo D'Oro, a unique interpretation of "panzanella"
After a love affair with the city of Rome for over a decade, the city provided the optimal location for my wedding. Rome lived up to its expectation of being a bureaucratic and customer service nightmare; but after a year of planning, several months preparing document after document, and innumerable hours waiting in offices, the event served as a reminder of just how much I love this place, even when I am determined to hate it. For anyone from abroad getting married in Italy, be prepared to compile a long list of documents and spend more time waiting in offices than what will amount to your wedding day. You will be required to make several trips to the Embassy, local legal offices and the tribunal with witnesses in tow. Each office will tell you something different. Then there were the traumatic episodes in dress boutiques around the Italian capital after which I ended up getting my wedding gown at an Umbrian monastery. One of the biggest challenges I consistently found during the planning and filing of my paperwork is what I believe will plague the rest of my life in Italy: the predicament of the birthplace. Italian officials seem unqualified to read American passports. I repeatedly had to explain why my birth certificate reads "Buffalo" and my passport reads "New York, USA". That New York is a state, in addition to being a city, and Buffalo is a city in that state. Several clerks refused to accept this and process my documents. If you do not plan to have a Catholic wedding, you are required to go to the City Hall for a 10 minute ceremony administered by the mayor or a representative of his. To book this hall, you must go 6 months in advance and wait in line for hours to make your request. But the documents a foreigner is required to put together are valid only for 6 months. There is high demand for this hall, because it is one of only 3 locations where a non-Catholic wedding can be legally performed. As part of the Lateran Pact signed by Mussolini, Catholic weddings count legally for state weddings. Any other religious denomination or civil wedding must be performed at the city hall. 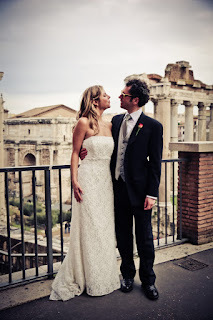 On the day of the ceremony, when I exited the "sala rossa" of the city hall entering Michelangelo's piazza atop the Capitol Hill, home to Rome's oldest settlement dating back to the 13th Century B.C., I felt privileged. To have celebrated such a significant life event in a place of such historic significance, all the administrative drama was more than worth it. With 20 of my closest family and friends at my side, I had views of the entire city of Rome, its eclectic blend of buildings testifying to an eternal presence, and its beautiful church tops and ruins and every glance. It is a medieval tradition that citizens getting married in Rome must publish their names in front of the city hall building for 7 days allowing for anyone to protest your union. Thankfully this is now accomplished online. Our reception was held in a medieval castle about 15 miles outside Rome. 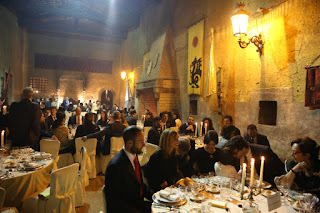 Despite some disorganization Castello di Lunghezza was the perfect location for a winter wedding. The staff had forgotten we made several visits and booked the hall 9 months earlier, and later told me when I made the appointment to pay the deposit 3 months beforehand that it would be under reconstruction all winter. Such archaic organizational methods I suppose are to be expected for an authentically historic and romantic setting. The castle was built in the 8th century and became property of the Papacy in the 13th Century. Our non-denominational Christian ceremony was officiated by my dear friend Rev. Tanya Halkyard, ironically in the Pope's former private chapel. narrow hallways and doorways of the castle providing excellent service. 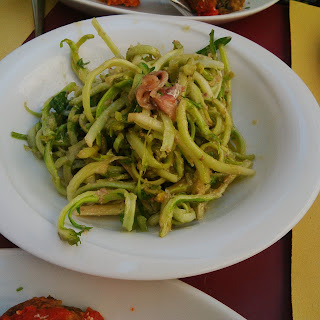 It was a challenge finding a balance between American wedding traditions of dancing and speeches and the Italian tradition of eating and more eating. We had a lot of all of the above. With Andrea Loco on DJ, we turned the stone walls and wooden ceiling of the castle into a soiree, burning off our many calories earned from a large buffet of prosciutto, porchetta and an array of fresh and aged cheeses, a seated dinner of 2 first courses and 2 second courses and a room reserved for dessert with all my Italian favorites...fried dough, freshly filled cannoli, tiramisu and Mont Blanc wedding cake. I am happy to share with you our wedding announcement published in the Buffalo News, highlighting the tremendous and generous efforts of friends and strangers of my hometown that helped in the un-romantic but very Roman process of planning my wedding in Rome. The beginning of the year is often a time of hope and optimism. As was the case 70 years ago in January when the concentration camp at Auschwitz was liberated. The tragedy of the Holocaust has left emotional and physical marks throughout the entire world. A plaque in the Jewish Ghetto in front of the Portico di Ottavia commemorating the victims of Holocaust deported on October 16th 1943. While Italy's role in World War II is often misunderstood, for lack of a better word, the country has worked effortlessly to improve and reinforce its sensitive image. While Italy has had a reputation for attempting to save the Jewish people from deportation, more than 2000 Roman Jews and other victims were arrested and deported to Auschwitz in October 1943 and only a handful returned after the gates opened in January 1945. An example of stumbling blocks that can be found all over Rome and Europe, placed at the doorsteps of victims of the Holocaust, indicating their name, date and place of deportation and date of death. The Romans have long been known for the ornate way they present themselves. A tradition that began with the Etruscans and their finely engraved gold and bronze jewelry. Fine jewelry making is a custom that is still alive and well in Rome, providing excellent opportunities to find hand-made, personal and luxurious holiday gifts and souvenirs from the eternal city. Please check out my article on the Context Travel blog that features some local artisans and what they are creating this season. St. Peter's Basilica and behind-the-scenes visit to the prestigious mosaic workshop and gallery. The Coliseum, San Clemente archaeological area, Circus Maximus, overview of Roman Forum and Palatine Hill. Circus Maximus racetrack, Palatine Hill, Medieval churches with underground ruins, ancient temples along the river banks in the city's ancient commercial marketplace, parts of the historic and charming Jewish Ghetto, Tiber island and Capitol Hill. Piazza Navona, Pantheon, Piazza del Popolo, and the best latent ruins, fountains and unique churches of the historic center. Mysterious underground Christian catacomb of San Callisto, mile markings along Rome's oldest road the Appian Way, Fosse Ardeatine World War II memorial site, ancient Aurelian Walls and inside the fortification gate of St. Sebastian. Home-cooked typical Italian dinner made up of several courses from archival family recipes accompanied with a cooking demonstration in “Mamma’s Casa”, the kitchen of a Roman family located in the affluent residential neighborhood of Parioli. Villa Giulia National Etruscan Museum, housed in a Renaissance Villa with thousands of Etruscan materials such as bronzes and pottery, as well sarcophagi and tomb re-installments with fine fresco paintings. 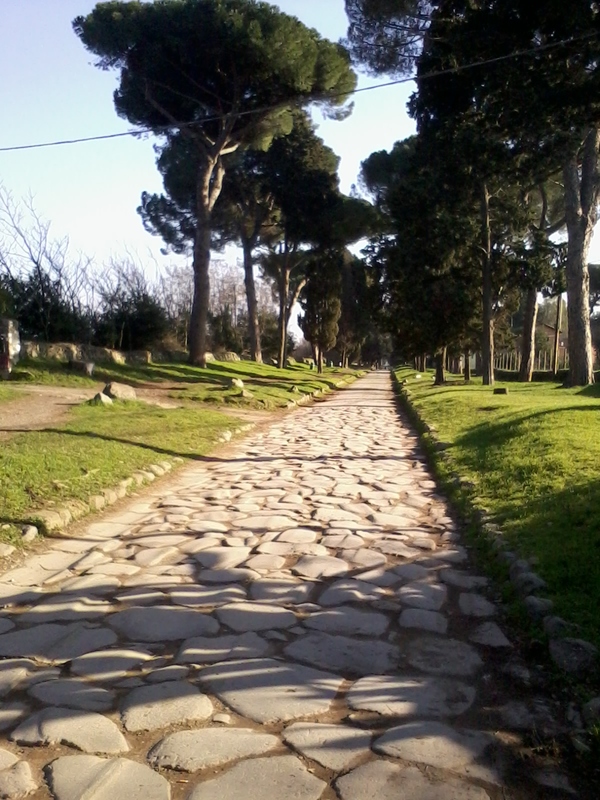 Traveling with a private driver, journey 30 miles north of Rome to the Bandidaccia necropolis in the city of Cerveteri, the largest burial site in the Mediterranean. Tour an extensive collection of unique tombs modeled on and decorated as domestic architecture lined along routes designed as a city plan. Include also the option to dine along the seaside in a Renaissance palace La Posta Vecchia, built on top of the Etruscan port. Journey by car a couple of hours outside the bustle of Rome into the landscape of Tuscany. Witness rolling hills, manicured vineyards and stop for wine tastings and cultural visits in a couple picturesque Medieval Tuscan cities, such as San Gimignano and Siena. Journey 20 miles outside Rome with a private driver and discover 2 of most spectacular and well maintained villas from the Renaissance and antiquity. First tour the beautifully manicured Renaissance gardens of Villa D'Este and saunter down the lane of 100 fountains. Then visit hundreds of acres of Hadrian's Villa meant to be the emperor's refuge from the bustle of Rome that now serves as yours while you get lost in a series of ruins of bath complexes, temples, and residences. Scavenger Hunt for kids-"Safari d'Arte"
Designed for curious elementary aged kids, covering several different itineraries including main city highlights, while participating in an interactive scavenger hunt searching for clues at each main attraction with book and map in hand. *Also consider any customized tour you can imagine focusing on the specifics of Ancient, Renaissance, and Baroque Rome.